I love a good novelty themed bath and T will spend ages playing with something new and exciting! Our bathroom is just off our kitchen (the joys of having a pre-war house!) I hated it before we had T but now I love the fact that T can have a bath and I can get on in the kitchen but we can still talk and I can keep an eye on him. I mixed about half a bottle of food colouring into the water - it's an old out of date one, I'm not sure if these new liquid colours would give as much colour, you might need to use gel or paste! I hung a towel at the window and turned off the light. 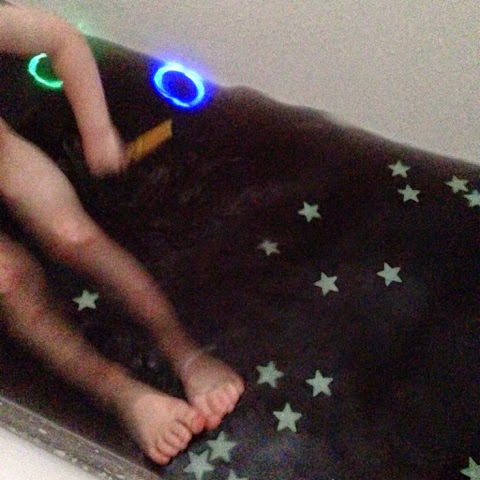 We threw in some glow stick bracelets and some fab stars which I got from eBay £1.29 for 100 - bargain! The stars floated beautifully against the dark night sky. T loved having a bath in the dark, he then asked if he could paint some planets so I gave him some shaving foam mixed with glow in the dark paint - epic fail! He still had fun painting with the foam. We also stuck stars on the tiles. As you can see, the water is not as black as it looks!! All in all we had a great time and clean-up was really easy a good way to use up some out of date food colouring too. Check out our space themed pinterest board or follow us on #booboxspace on Instagram and twitter. 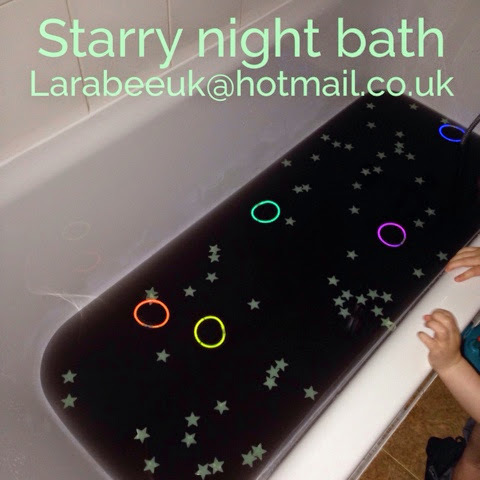 If you liked this sensory bath, you might like our others here.